Do you remember the fun of building sandcastles at the beach? It’s something almost every child loves to do, but perhaps not for too much longer. According to an article published in The New York Times last week, seventy-five to ninety percent of the world’s natural sand beaches are shrinking. According to Professor Gillis of Rutgers University, this is due to a combination of increased storm activity, rising sea levels and human development of the shoreline. Landsat 8 Image of Chesapeake Bay from the 28th February 2014. Image courtesy of the U.S. Geological Survey. The impact of storms was demonstrated last winter when millions of tonnes of sand were stripped from our shores. The beach at Formby in Liverpool lost thirteen metres of coastline, whilst in Cornwall Perranporth lost about a million tonnes of sand, Fistral Beach in Newquay lost thousands of tonnes of sand and the beach at Bude almost disappeared completely. 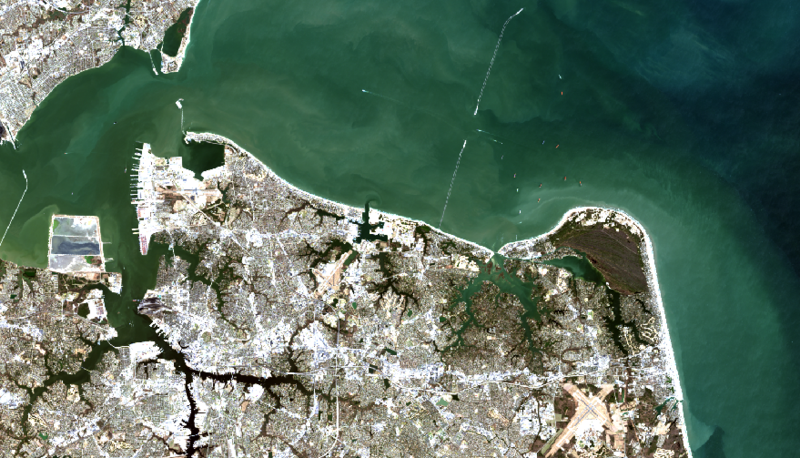 A snapshot of sediment movement can be seen in the Landsat 8 image above of the mouth of Chesapeake Bay in Maryland, USA. The Chesapeake Bay Bridge–Tunnel can be clearly seen stretching to the north, with a number of boats passing through it. The image is displayed as a pseudo-true colour composite, combining the red, green and blue wavelengths with some enhancements to bring out specific features. The suspended sediment around the coast can be seen in the complex colour patterns of turbulence and movement, and during storms this sediment will include the larger, and heavier, sand particles. However, anyone who visited the seaside this summer might not have noticed the major loss of sand from last year’s storms. This is because beach replenishment is a major activity in many areas, either because the beach forms part of the protective barriers for the land or because the beach is tourist attraction. Sand is not an infinite resource, and most replenishment comes from other beaches, dredging or mining. For example, this year areas around Bridport and Lyme Regis in Dorset were reshaped with sand recovered from harbour dredging. Beach replenishment is not the only usage of sand. Sand is the most consumed natural resource on earth, and the biggest user is the construction industry in the production of concrete. However, it is also used in any process that requires silicon dioxide which includes everything from wine to toothpaste, glass and computer microprocessor chips. In fact, according to The New York Times, the US sand and gravel business is fastest growing sector in their economy. Sand is becoming scarce in the world. We need to start taking care of our sand, and think carefully about how we use it. Should we replenish every beach that loses its sand? If we don’t do start to take shrinking sand seriously, future generations of children may never experience the joy of building sandcastles on a beach. This entry was posted in Landsat, Oceans, Policy, visualisation and tagged Beach, beach erosion, beach replenishment, Bude, Chesapeake Bay, concrete, Cornwall, dredging, Fistral Beach, harbour dredging, Landsat, New York Times, Newquay, Perranporth, sand, sandcastles, UK Winter storms 2013/14 by Andy. Bookmark the permalink.